Oral family history passed sometimes conflict with information gathered during a treatment. 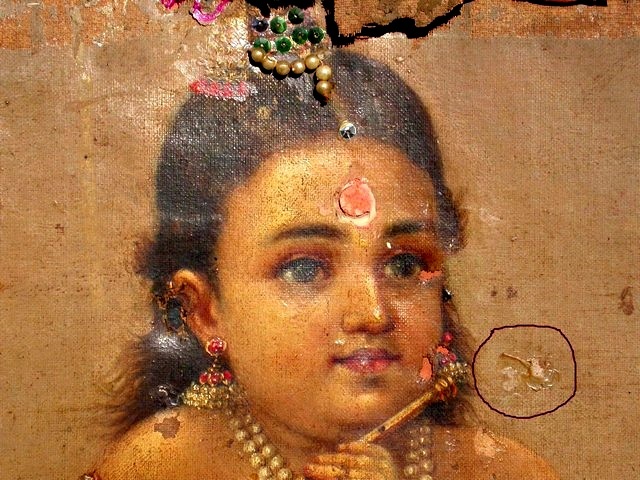 The owner supplied the following: "My Grandmother's sister said that her father in law personally worked for Raja Ravi Varma and he definitely painted this picture." 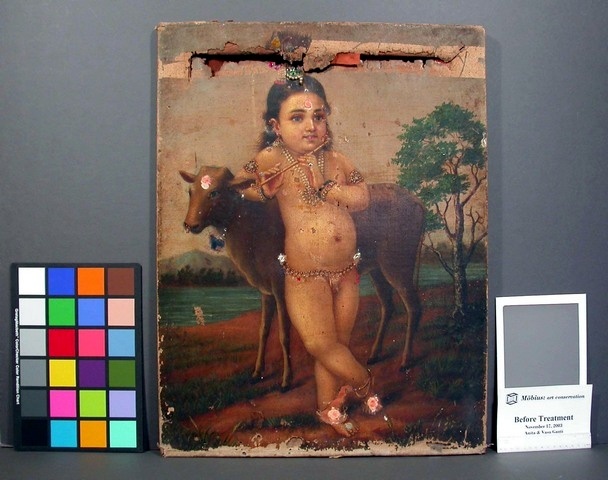 Varma brought about a momentous turn in the art of 19th c. India and influenced generations of artists. 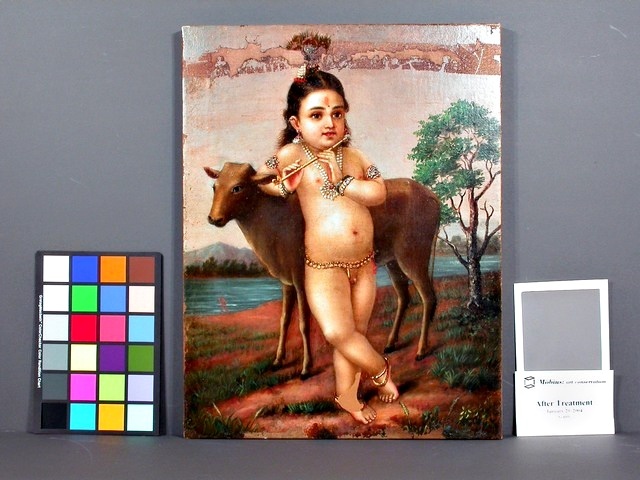 He was the first to cast the Indian gods and mythological characters in natural surroundings while employing a style of European realism. 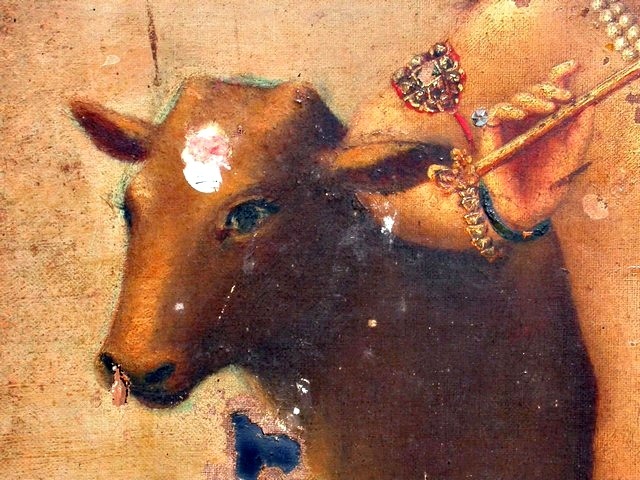 The "irregular" signature on the verso was probably executed by M. Arumoogham Pillai from Trivandrum in 1891. Pillai is credited with teaching Ravi Varma. 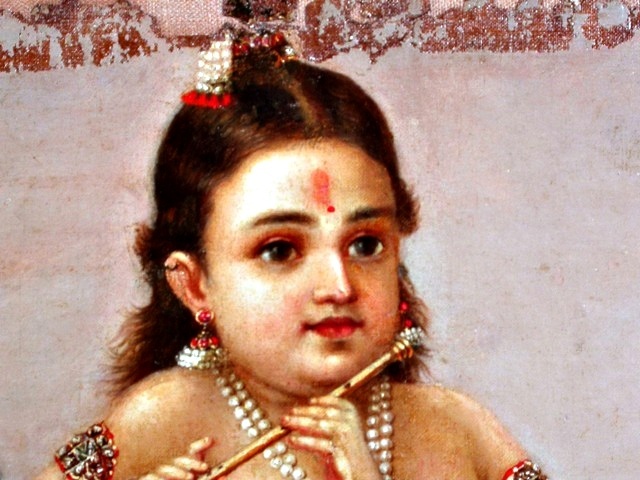 Trivandrum (now Thiruvananthapuram) is where Ravi Varma lived while learning to paint. The famous Ramaswamy Naicker of Madura, recognized a potential rival in Varma and refused to teach him but his student, M. Arumugham Pillai would sneak into Moodath Madam at nightfall to share his knowledge with Varma. Thus the attribution to Pillai bears some reconsideration. removed in the past, it also removed paint from the sky. A pressure sensitive tape is visible as orange patches. onto the headdress and other parts of the painting. 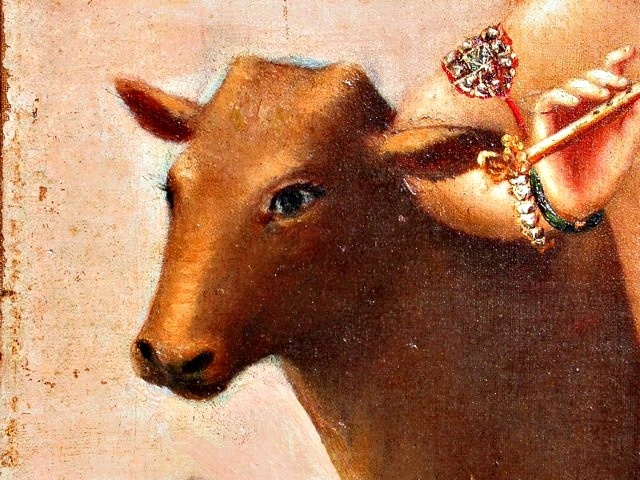 Part of the religious use of the painting included pressing burning incense onto the foreheads of the sacred beings. 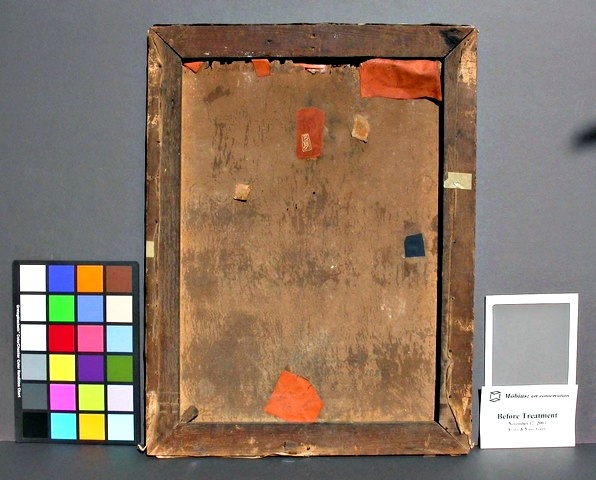 Removal of additions, surface dirt, and discolored varnish. Inpainting (retouches) of the losses recover the aesthetics. The client elected to fill the voids with toned fabric and not retouch the losses in the sky and left foot. We mitigated the visual flaws without reconstructing the missing elements.